Production of the film version of Norwegian author Jo Nesbø’s best-selling crime novel Snømannen (The Snowman) was getting underway in Oslo this week. Among the planned filming locations is the classic old restaurant Schrøder, a favorite hangout of Nesbø’s main fictional character, inspector Harry Hole. 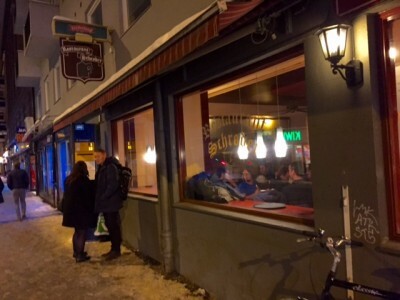 Schrøder was predictably packed on a recent Monday night in January, with diners including one of Norway’s top modern artists and noisy groups still celebrating the New Year. The restaurant has been around for decades and draws crowds not so much for its food (the type common and popular in Norway in the 1960s, like the large meatballs called kjøttkaker with stewed peas) but for the ambiance of an iconic once-smoke-filled “brown” café. Now there’s no smoking allowed, but the food and drinks are still relatively reasonably priced by Norwegian standards and there are plenty of photos of Nesbø and various celebrities on the walls as well. They may be joined by the stars of the Snowman film, including Michael Fassbender, Rebecca Ferguson and Charlotte Gainsbourg. Fassbender flew to Oslo on Friday, just after learning that he’d snared an Oscar nomination for his role as Steve Jobs in the film with the same name. Norwegian Broadcasting (NRK) reported Monday that filming will take place in Oslo, Bergen and, in March, in Rjukan in the mountains of Telemark. Other Oslo film locations will include Oslo City Hall, Holmenkollen and Ekeberg. On Monday, film crews were busy around Monolithen in the Frogner Park. Around 1,700 extras will be part of the filming by Universal Pictures. Author Nesbø himself was said to be on holiday when filming begins. The film is the largest production to be mounted in Norway to date.